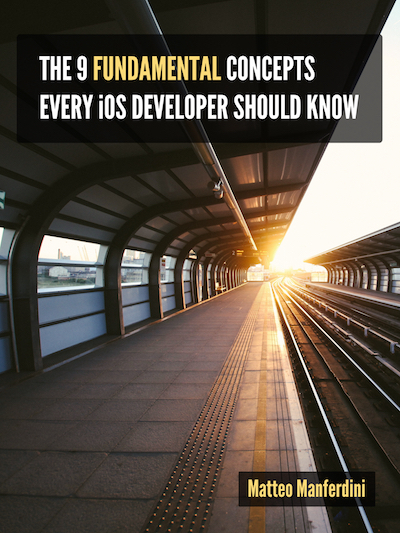 When starting iOS development, it’s hard to know what you should learn first. There are so many concepts and every single one of them seems important. But they are not all the same. My long experience in iOS development taught me that there are some fundamental concepts that are more important than others because they are part of every single app you will ever make. Still, nobody seems to talk about this. They just write tutorial after tutorial on different topics. While some of these might be good in explaining the concepts, they never tell you: how important is this? Should you spend your time learning this or your time would be better spent learning something more fundamental? This is exactly why I wrote this guide. This is a collection of all those concept you will meet again and again in iOS development. In this guide you will find a brief introduction to each one of them, highlighting the key points you should know and why they are important. Each chapter explains one concepts and includes the links to the relevant free guides from Apple where you can deepen your knowledge on the topic. It takes me a lot of time to produce my free material, but it is my pleasure to give it to you as a gift. If you know someone else that might benefit from this guide, take a moment to share it clicking on the buttons below. The more people I can reach, the more time I can dedicate to produce even more high quality free material for you. Thank you.